The built environment we inhabit today would be unrecognizable to someone living 100 years ago, yet the forces that shape it are a living legacy of well over a century of planning theories, transportation technology, and politics. What has remained constant through history is the link between transportation and land use: The form of towns and cities is affected by the forms of transportation made available. Conversely, the modes of transportation people choose to use are affected by the way their towns and cities are planned. In the early 19th, America was a rural nation. Most people lived on farms, and transported their produce by horse and cart to the nearest town to sell it. Roads were little more than dirt tracks, and so the limited amount of freight that moved between towns and cities went by waterways. Even the largest cities of the day, which grew up at major sea or river ports, were small enough that their residents could walk anywhere they needed to go. Early American towns required little in the way of planing beyond laying out streets, and a simple grid pattern was found to be satisfactory for all but a few cities. Starting in the 1830’s, America began to develop into an urban nation. By the end of the 19th century, most of the population had migrated to densely developed industrial towns and cities. All development followed the lines of steam railroads or electric trolleys, and passengers could move from anywhere to almost anywhere else on these. Horse-drawn vehicles were still used for short hauls, but almost all long-distance freight went by rail. Trucks had not yet been developed, and roads were in the same sorry state they had been in a century ago. In the “laissez-faire” spirit of the time, the railroads and trolley lines were built wherever their owners saw an opportunity for profit, and the towns that grew around them were planned in much the same way they were a hundred years earlier, which led to problems. Firstly, the railroad companies held an enormous amount of power, and were extremely corrupt. Secondly, the industrial cities were overcrowded and polluted, and the working class mostly lived in unsanitary slums. There were a number of reactions to these problems. Railroad and factory workers formed labor unions, which became very powerful. Cities began to put more thought into planning parks, civic centers and transportation systems, and great strides were made in sanitation. Farmers campaigned for better roads and the regulation of railroads, demands which were met by a government which had grown to distrust the railroads. Can anyone tell me in which year this photograph was taken, and which avenue is depicted? – Early efforts at city planning had done little to make cities less polluted or overcrowded. – Labor unions pushed costs up for railroads and trolleys, but the automobile industry had not yet unionized. – Government regulation of railroads diminished their ability to compete with cars and trucks. – Roads were provided to the public free of charge, whereas trains and trolleys had to pay for their rights-of-way. Railroads and trolley lines modernized their operations to try and compete, but still lost business because of the factors working against them. During the depression, many lines closed down altogether. It didn’t help that many unemployed people were riding freight trains for free, or that the New Deal involved the construction of numerous highways. – Government agencies financed mortgages on new homes, but only those constructed in new suburbs. – Zoning was used as a tool to restrict new suburbs to middle-class residents. – Many of the new suburbs incorporated themselves as separate municipalities, resulting in lower taxes for suburbs, and inferior public services for urban areas. – A wartime tax on passenger train fares was not repealed until 1962. – Railroads were losing money, and eliminated passenger trains wherever possible so they could concentrate on more profitable freight trains. – Trolley lines converted to buses, a move which saved money but lost passengers. – Urban renewal, the government’s solution to urban problems, was based on faulty planning principles, and made cities even worse places to live. – A great deal of government money was spent on multi-lane highways, including the Interstates. These not only took passengers away from transit, but opened up land for suburban development outside cities, and destroyed urban neighbourhoods through which they passed. Much of this spending was the result of vigorous lobbying on behalf of automobile and oil companies. The new suburbs were developed at a much lower density than before, were inaccessible without a car, and included shopping centers and schools as well as houses. Meanwhile, the mechanization of cotton picking made millions of southern blacks unemployed, and many moved to cities where manufacturing jobs were plentiful. The two migrations kept the population of cities stable, at least for the time being. Cities suffered greatly during this time. Most began to take on the form of a downtown containing mostly offices and parking, and neighborhoods containing mostly factories and their poorly paid black workforce. The shrinking tax base in cities led to a level of public services such as education and policing far inferior to that in the suburbs. Even small towns decayed into ghost towns as their main streets lost businesses to suburban shopping centers. The loss of manufacturing jobs in the 70’s and 80’s hit cities hardest. People who had moved from the South only a few years earlier found themselves out of work again, but this time had nowhere to go. Those that could moved to the suburbs where work was plentiful, but many more became trapped in the vicious circle of lack of education, unemployment, and poverty. Cities lost a great deal of population, as much as half in the case of Detroit, leaving their neighborhoods looking like bomb sites. By the late 60’s, transit had almost disappeared, and it was clear that it would disappear altogether unless it was subsidized like cars were. Transit operations were taken over by public corporations, with limited amounts of funding. These funds were increased during the oil crises of the 70’s, and cities such as Washington and San Francisco constructed rapid transit systems. Even inter-city rail services got a last minute reprieve when Amtrak was formed in 1971. The decline in transit use was temporarily halted, but began again during the Reagan years, when federal funds for transit were drastically cut. Transit funding increased again in the nineties, and numerous cities build light rail and commuter rail systems, sparking a small renaissance in downtown development. Regardless of the ups and downs of transit funding, the lion’s share of transportation money has gone to highways. As a result car use continues to increase, and most development is still suburban in nature, although after 1970, suburbs began to take different forms. Now that suburbs include office buildings, sports venues and museums, they can exist independently of central cities. A general dissatisfaction with the physical appearance of suburbs led to the complex maze of regulations that shape toady’s suburbs. 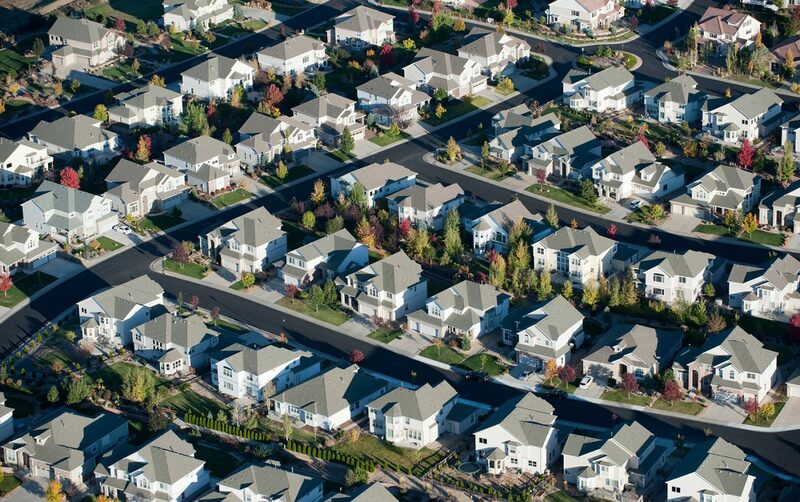 Gridded street layouts were abandoned in favor of sinuous networks of culs-de-sac. Zoning laws were extended to address not only lot sizes and permissible uses, but also parking requirements, buffer zones, façade treatments, and billboards. While it could be argued that these regulations have made today’s suburbs more beautiful than those of forty years ago, their primary effect has been to foster car dependency, increase development costs, and make it illegal to build anything remotely walkable. The urban system was created by market forces, with almost no government involvement, but there were many problems with this system. The reactions to these problems, by governments, industry, institutions and individuals, resulted in the gradual replacement of the urban system with the suburban system. While many of the problems of the urban system have been solved, others have taken their place. The solutions to these lie in creating a new system, one that combines traditional walkable urban forms with modern transit technology, and balances market forces with responsible government.